I hope you all enjoyed the mid-term break. Most of you probably enjoyed Hallowe’en too. Do you know why we call that evening [31 October] Hallowe’en? So, Hallowe’en means the evening or the night before the day when we remember all those who are blessed or holy, those we call the Saints, on All Saints’ Day [1 November]. We celebrated All Saints’ Day on Wednesday last in Saint Mary’s Church, Askeaton, and we remembered this special day again in some of our prayers in church in Askeaton and Tarbert yesterday [5 November 2017]. This has been a major feast day in the church for hundreds of years. So, do you have a favourite saint? Does anyone here have a name that is a saint’s name? Do you know the story of that saint? 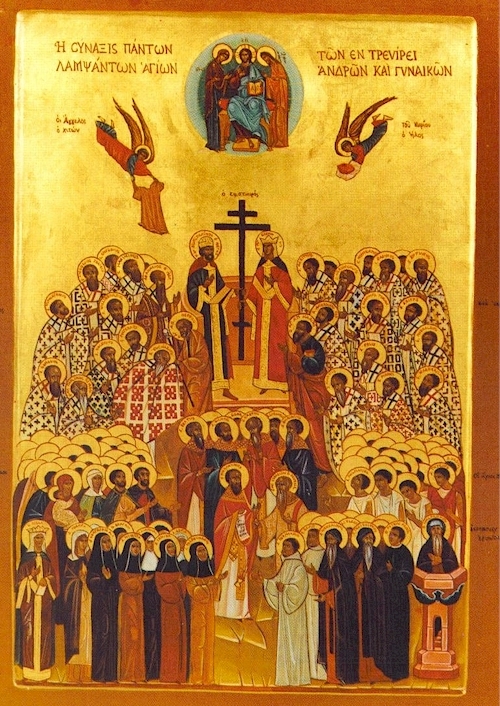 Saints do not have to be martyrs. Do not have to live or die in ways that none of us lives or dies. Saints do not have to be canonised. There are people who handed on the faith from previous generations – teachers, grandparents, perhaps neighbours – even though they may be long dead by now, who are still part of our vision of the Communion of Saints. Saints do not have to live a perfect life … none of us lives a life that everyone would regard as perfect. And saints do not have to be shrouded in superstition. In the Gospel reading for All Saints’ Day (Matthew 5: 1-12), Christ tells us who his saints are, those who are blessed, those who are holy, those who are example of how we should live our lives. Those who mourn, for they will be comforted. The meek, for they will inherit the earth. Those who hunger and thirst for righteousness, for they will be filled. The merciful, for they will receive mercy. The pure in heart, for they will see God. The peacemakers, for they will be called children of God. Those who are persecuted for righteousness’ sake, for theirs is the kingdom of heaven. We, you and me, can all be saints for Christ’s sake and for the sake of Gospel values in our lives. The Beatitudes set a good standard for how we can do that. The saints are: the poor in spirit, those who mourn, the meek, and those who hunger and thirst for righteousness. The saints are: the merciful, the pure in heart, the peacemakers and those who are persecuted. (Revd Canon Professor) Patrick Comerford is Priest-in-Charge, the Rathkeale and Kilnaughtin Group of Parishes. These notes were prepared for a school assembly on Monday 6 November 2017.